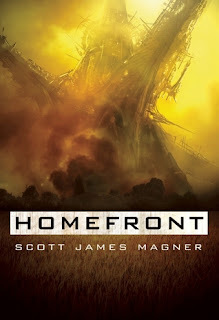 Homefront by Scott James Magner is a recommended science fiction novel set in the 27th century. The novel will hook you right at the start with the discussion of the Transgenic virus as learned about in a Congressional inquiry. Then the action jumps to the future after the Transgenic virus has already mutated individuals and we meet Commander Jantine and her infiltration force of soldiers, scientists, and engineers on a suicide mission. They are all exiles from Earth's outer colonies. Although they know they may not survive their mission, they are part of a plan to establish a new, secret colony on Earth. The mods or gennies (modified or genetically altered humans) have divided themselves up into a cast system based on how altered they are from an unmutated human, with Alphas being the highest. Jantine is a Beta. At the same time, in alternating passages, we meet Lieutenant Mira Harlan of the System Defense Force. She is on a dreadnought outside of Earth's orbit and part of a clandestine fleet with a secret mission. When Jantine's ship inadvertently crashes into the dreadnought, it sets into motion another secret plan based on cargo the ship is carrying. This secret mission is a result of a conflict on Earth. Circumstances result in Harlan joining forces with Jantine's group. The quality of the writing in Homefront is great, but sometimes the presentation of the narrative could have been better. After being pulled in with a compelling opening scene, I was left struggling a bit with following all the characters and their different points of view at the beginning. I couldn't help but wonder if it could have been alleviated with some more background information on them right at the start rather than leaving it all for the reader to piece together. Sometimes it's cool to just give us clues and hints with a big reveal later, but sometimes it helps to have a bit more information to sort characters out from the start. Those who appreciate military conflicts or engagements in their science fiction are going to enjoy the action and combat scenes. There is some philosophical pondering on what makes us human, as well as questions on how family should be defined. There is telepathy between characters that reads like dream sequences, which can be a plus or minus depending upon the reader's feelings. This is likely the first book in a new series, The Transgenic Wars, because the ending suggests a continuation of the story. Disclosure: My Kindle edition was courtesy of Resurrection House for review purposes.